For a long time I was not a huge fan of Risotto maybe since I somehow thought that cooking rice is not a real challenge but then I had an amazing Risotto at an Italian restaurant and realized it is not that simple. When I cooked my first Risotto I really knew how difficult it is. Maybe you have already tried my Vegan Mushroom Risotto, still one of my favorite savory, soul food dishes. 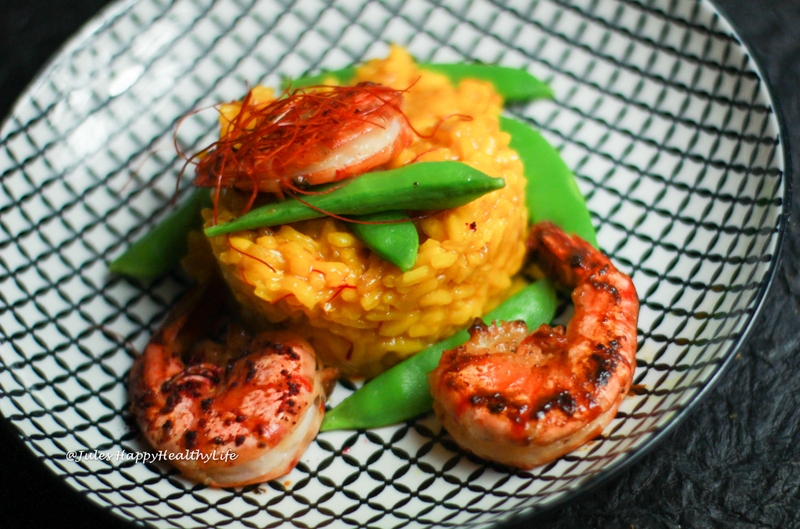 This Saffron Risotto with Miso Tiger Prawns is obviously not vegan but later I will tell you some option on how to make it as a yummy vegan version. I am not a vegan and I understand that a lot of people decide to not eat animal products because of ethical or health reasons. I do not eat much dairy besides cheese once in a while and when I eat meat, fish or so I make sure where they come from. Believe it is strange that we live in a world where people spend 4 Dollar on a coffee but complain about the price for high quality food. So if you are vegan and still like to make Saffron Risotto with Miso Tiger Prawns then please look at my recipe for vegan Mushroom Risotto there I tell you about using Nutrional Yeast to get that Umami flavor that is normally added through the Parmesan. Further instead of using Tiger Prawns you can also marinate either Tofu or Vegetables in the Miso Dressing and add it as a topping to the Risotto. Beautiful colors and a broad range of flavors make this Saffron Risotto so unique and delicious. 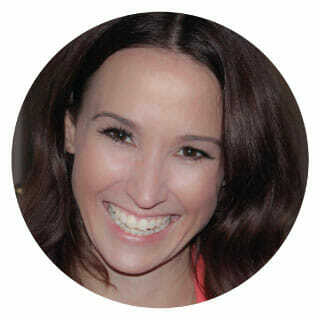 To me life is about moderation and enjoying the moment. Most of the time we all keep running from one goal to the next and forget to really enjoy the moment. If you are like me an impatient person, than making Saffron Risotto or Risotto in general will teach you some humility. The important part about the perfect Risotto really is patience. You need to stir the rice constantly, make sure all liquid is absorbed until you add more liquid. Further the liquid needs to be warm before you add it, so sounds like a lot of preparation but believe me, when you taste the Saffron Risotto you will know it was worse all the work. Instead of using Parmesan you can use nutrional yeast to have this Umami flavor that is added through the Parmesan. The Prawns can be substituted with Miso glazed Tofu or some vegetables for example and you have an amazing vegan recipe. I was lucky I did get my Saffron from a dear friend. The boyfriend of hers is doing logistics and getting sometimes saffron from his boss. Fortunately for me she does not know how to use the saffron therefore she gave me some and I came up with the recipe for Saffron Risotto. With saffron you need to make sure to store it airtight and best in the dark since the colors fades pretty easily. Further when cooking with saffron make sure you do not add it too early since the flavor is very delicate. With the price for saffron you want to make the most out of it. Good choice is for sure Saffron Risotto with Miso Tiger Prawns. Best to start marinating the Tiger Prawns. You just combine the Sesame oil, Miso and Chili Flakes and poor it over the Prawns, massage it gently in. Shortly before the Risotto is done, approx. 5 minutes before you heat a pan with the Coconut oil and sautee the Prawns for around 4-5 minutes. When they are done you add the Tamari and squeeze some lime over them. Peel the onion and mince it. In a pot heat the chicken stock and set aside, make sure it stays warm enough. In another pot heat the coconut oil and sautee the onion until golden, then add the rice and further sautee it for 2-3 minutes. Then add the white wine and let it reduce while you constantly stir the rice. Add the stock slowly while you stir, do not add more liquid until the rice has absorbed all the added liquid. Will take around 20 minutes until the rice is done. The rice should still have a bit of a bite to it, you are not cooking rice pudding. Further you want to have a bit of liquid in it, not a soup but should also not be totally dry. After 15 minutes add the saffron, best when you just add liquid. You can ground the saffron right before in a mortar to release all flavors. If you also do the sugar peas, put them in boiling water shortly before the Risotto is done. When the Risotto is done add the Parmesan and gently fold it under the Risotto. Serve the Risotto right away with the peas and Miso glazed Tiger Prawns as a topping. Enjoy! !